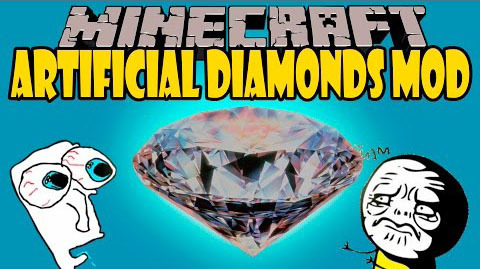 Artificial Diamonds Mod, as its name says, adds a new material to your game, Artificial diamond. You can do a lot of things with this material such as crafting new armour and tools that will not be worse than a classic diamond armor. To craft this element, at first, you need to craft coal block and put it in the furnace. We will receive new material — Carbon. 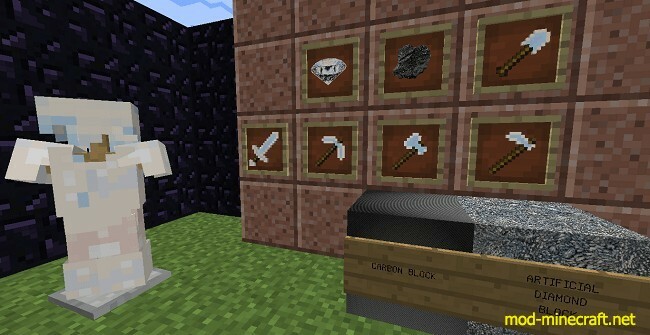 Then, you need to craft Carbon block, it crafts like a Coal block, but with new material. At last, you need to put the Carbon block in the furnace and we will receive new material like a classic diamond: Artificial diamond. To create tools/weapons or armour you need to use artificial diamonds. You can craft them using classic minecarft recipes, but using only new material. Dry ice is a new block which has gravity and particles surrounding it. You can use it for Ice Sword craft. To craft ice sword you need to use classic minecraft recipe but with using dry ice ingot.